NASA Time Trials allow for almost any car to compete for the fastest lap time on a legitimate race course. One guy rolled up in his daily driver Lexus and crushed everyone. He ran the car bone stock (other than a set of Hoosier Tires andCarbotech brake pads for track duty) and hit 150 miles per hour on the banking. 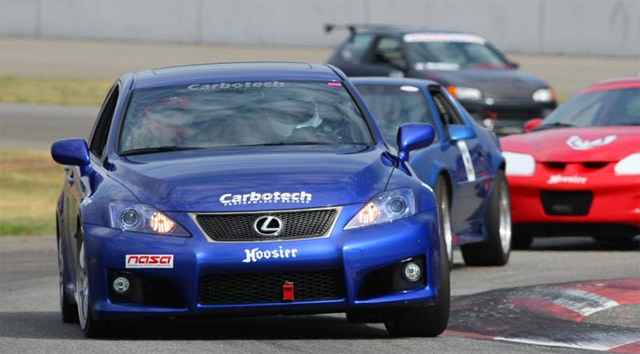 Regardless of the number of doors the car has, obviously the Lexus is not shy of performance. The car won the TTB class against dedicated trailered racecars with full rollcages, no interiors and heavily modified suspensions. As a three time SCCA solo national champion and two time NASA road racing national champion, Schotz is a proven racer, but no matter — cleaning up on the track with a daily driver (even an IS F) is still a story to tell.